He married Sarah Ann Briggs13 [Viola Briggs3], Mar 5 184813, Rush County, Indiana13. Sarah was born Indiana. Henry Henshw, age 23, born in Ohio; farmer. Sarah A. Henshw, age 23, born in Kentucky; cannot read or write. Ester L. [or A. - unclear] Henshaw, age 1, born in Indiana. Henry Henshaw, age 33, born in Ohio; farmer; $500 personal property. Lucinda Henshaw, age 21, born in Indiana. Hester Henshaw, age 11, born in Indiana; attended school. James Henshaw, age 8, born in Indiana; attended school. Wm Henshaw, age 6, born in Indiana; attended school. Mary Henshaw, age 4, born in Indiana. Hanshew, Henry, age 43, born in Ohio; farmer. Hanshew, Drucilla, wife, age 32, born in Indiana; keeping house. Hanshew, James, age 20, born in Indiana; cannot read or write. Hanshew, William, age 18, born in Indiana; cannot read or write. Hanshew, Mary E., age 14, born in Indiana; cannot read or write. Hanshew, Sarah A., age 8, born in Indiana. Hanshew, Alfred C., age 2, born in Indiana. Hanshew, Susanah, age 40, born in Ohio; "whether dead, dumb, blind, insane, idiotic, pauper or convict": mame [unclear]. Hanshew, Henry, age 53, born in Ohio; father born in Pennsylvania; mother born in Tennessee; farmer. Hanshew, Druzilla, wife, age 42, born in Indiana; father born in Pennsylvania; mother born in Tennessee; keeping house. Hanshew, Sarah A., daughter, age 18, born in Indiana; father born in Ohio; mother born in Indiana. Hanshew, Alfred C., son, age 11, born in Indiana; father born in Ohio; mother born in Indiana. Hanshew, Tabitha, daughter, age 5, born in Indiana; father born in Ohio; mother born in Indiana. Hanshew, Jane, daughter, age 31, born in Indiana; father born in Ohio; mother born in Indiana; divorced. Swarts, Perry E., grandson, age 9, born in Indiana; parents born in Indiana. Swarts, James R., grandson, age 5, born in Indiana; parents born in Indiana. Swarts, Rosa Alice, granddaughter, age 3, born in Indiana; parents born in Indiana. Swarts, Nora, granddaughter, age 11 months, born Jul  in Indiana; parents born in Indiana. Hanshew, Henry, head-of-household, age 73, born Jan 1827 in Ohio; parents born in Virginia; married 42 years; occupation: day laborer; rented home. Hanshew, Drucilla, wife, age 63, born April 1837 in Indiana; father born in Tennessee; mother born in South Carolina; married 42 years; 2 children, 2 living. Hanshew, Alford C, son, age 30, born June 1869 in Indiana; father born in Ohio; mother born in Indiana; occupation: day laborer. Hanshew, Charles L B, son, age 19, born Dec 1880 in Indiana; father born in Ohio; mother born in Indiana; occupation: day laborer. Hanshew, Drucila, head-of-household, age 71, born in Indiana; father's birthplace unknown; mother born in Tennessee; widow; 16 children, 4 living; rented farm. Hanshew, Chas, son, age 29, born in Indiana; father born in Ohio; mother born in Indiana; single; occupation: day laborer, farm. Hanshew, Alfred, son, age 39, born in Indiana; father born in Ohio; mother born in Indiana; single; occupation: day laborer, farm; cannot read or write. 1860 census, Pipe Creek Township, Madison County, Indiana; page 333, line #33, dwelling #769, family #769. 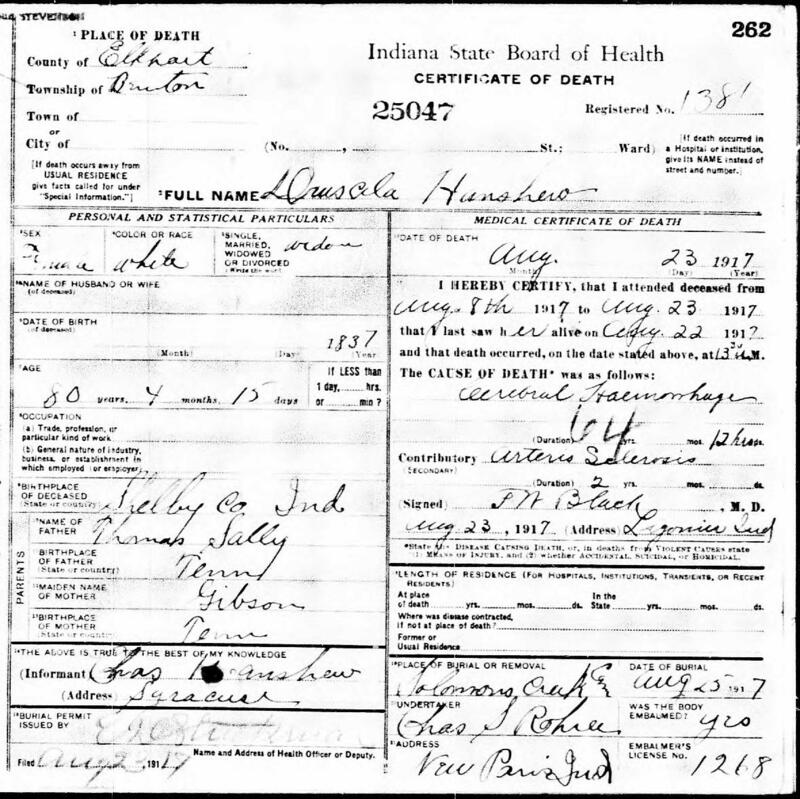 Esther Jane Hanshew death certificate. James Henry Hanshew death certificate. Sarah Alice Hanshew death certificate. 1880 census, Madison Township, Tipton County, Indiana; roll T9-315, ED 138, page 159D, line #21, dwelling #289, family #294. 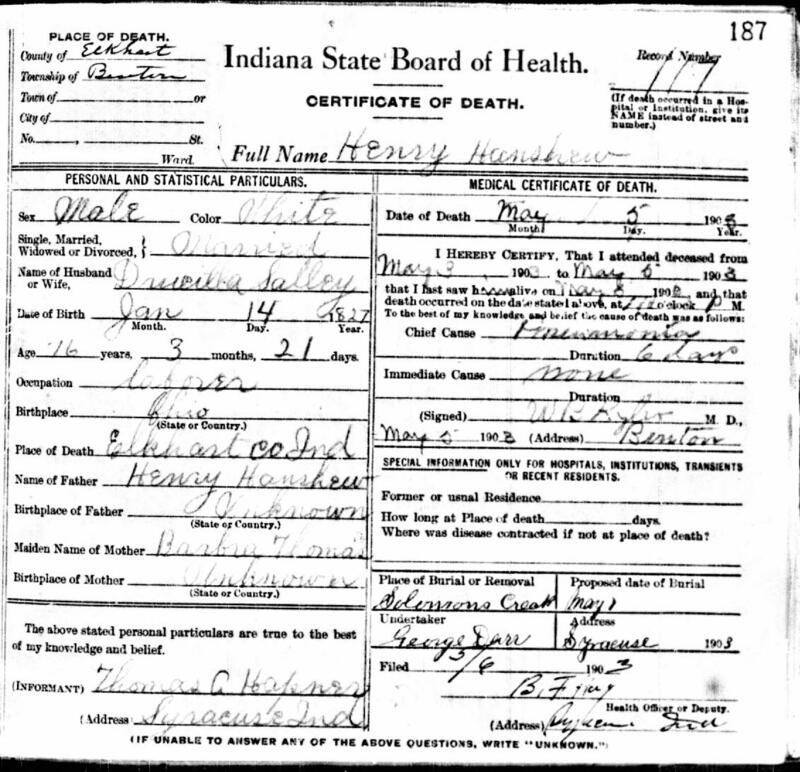 Alfred C. Hanshew death certificate. Bertha F. Hanshew death certificate. Charles L. Benton Hanshew death certificate. Index to Death Records, Elkhart County, Indiana 1882-1920; Indiana Works Progress Administration, 1938; Book H-14, page 29.